Foldify for iPad is a brilliant little app that is the embodiment of ‘creative.’ It allows you to print 3D figurines and to make them you don’t even need to know how to draw all that well. 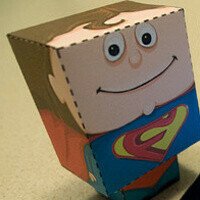 With tons of templates (some available through in-app purchases), the $1.99 Foldify for iPad makes it easy to create that colorful Superman figurine with your face on it to then print out. Cut, fold and glue it all up, and in no time you’d have a whole collection of paper toys on your desk. The app is brilliant, we can easily imagine playing with it for hours, but what’s best is that if you are parent you can engage the kids in the process. A live preview of your creations is always shown, and with a printer at home you can see the results of your work right away. You can also see what others have shared and print it out without much thinking. In either case, this is one app that we like from the get-go, and we don’t see how you can regret buying.